Why never talk about the top of the pyramid: The Jesuits? Please, read Vatican Assassins 3er Edition. 1836 pags all about the Vatican and the Jesuits controling, the CFR, New Age movements, Knights of Malta, Masons, World Bank, zionist, etc. All of the creepy organizations! The only media who touch this Super-important topic is the Dr. Bill Deagle's Nutrimedical Report Show in Genesis Radio Network, he isn't afraid of it. "The Jesuits are a military organization, not a religious order. Their chief is a general of an army, not the mere father abbot of a monastery. And the aim of this organization is: Power. Power in its most despotic exercise. Absolute power, universal power, power to control the world by the volition of a single man. Jesuitism is the most absolute of despotisms: and at the same time the greatest and most enormous of abuses? The general of the Jesuits insists on being master, sovereign, over the sovereign. Wherever the Jesuits are admitted they will be masters, cost what it may. Their society is by nature dictatorial, and therefore it is the irreconcilable enemy of all constituted authority. Every act, every crime, however atrocious, is a meritorious work, if committed for the interest of the Society of the Jesuits, or by the order of the general." -Napoleon Bonaparte. Enlight the top of the pyramid! Last edited by Ashatav; 10-13-2008 at 08:27 PM. Re: Why never talk about the top of the pyramid: The Jesuits? There needs to be more investigation into the Papacy and the Jesuits. What is the purpose of the Jesuit Order? Why does it exist? It is quite simple: the Jesuits seek to convert the world to Roman Catholicism. And in order to achieve this goal, they have not hesitated to use every means, both fair and foul – especially foul. They have not hesitated to lie, cheat, commit murder, or use revolution, if need be, to further their aims. At the very top of their priorities has always been the destruction of spiritual free will, as shall be seen. For the spiritual conflict must be discerned in all this: Satan’s ages-long war on the Church of the living God (Rev.12). For centuries, Rome has been the centre of Satan’s assault on the saints of God (Rev. 13:7; 17:1-6; 18:24; Dan. 7:25). Through the Inquisition and other means, the devil sought to wipe out the Church of Christ. Then, with the formation of the Jesuit Order in the sixteenth century, a new and deadly weapon was created to be used against biblical Christianity. Because extraterrestrial forces control their programmed effort. They are just the current force to do this for momentary exclusivity. Impermanence. There was a different pyramid in place before a Jesuit was called a jesuit. Never forget this topic: Jesuits controls NWO. And off world entities controls Jesuits. But we all are inside a larger game. In a sense, it all depends on which theory you subscribe to or how you interpret your research. Although, I believe that the Papacy and it's various internal organisations such as the Jesuits play a major role in how the world is controlled, through the bloodlines in Europe and America, it seems that they are pawns of the off world entities that Ashatav mentioned earlier. This coupled with the theories from Zeitgeist, the movie and Vatican Assassins could provide some useful insights. Let's talk about the Jesuits men. The World banks, CFR, TC, Bildergbergs. Realize it, they life are dedicated to infiltration. Read Vatican Assassins and Fr. Alberto Ribera History. Google them. The alternative media NEVER touch those topics. They guide your atention to other sources, to the syntom not the source of the problem. Eric John Phelps Radio show. Know What are behind the problems, being the heart of it, not in front being just the face. No, they were not the first to create anything. The J's were liers from the start and the origional IAC agents. They want to know what you know and how you learned it. Keep thinking and researching ~! ~! ! ups sorry my mistake, the evangelist are infiltrated by them. Really have to look out the Alberto Ribera's history, it gives you a clear picture about the catolic church and the jesuits. People have to progress along the rabbit hole at their own pace. First get em used to the idea that the Bush administration are the ultimate evil, then move em on to the Rockefeller/Rothschild global mafia families, then move em on to mutliple banking families, then zionists(they may be one and the same, not sure), then jesuits, then possibly extra terrestrial beings. But hopefully it doesn't move on to aliens because I'd rather this be a problem fixed by a mass revolution against malevolent humans. But yeah, people just have to start off small. If you try to expose people to Jesuits and the Vatican right off the bat but not get them used to the smaller "state sponsored terror" idea, then they'll get confused and think you've just been reading too much Dan Brown. I myself are at the level of "banking families/zionists" level and I know little of Jesuits. But once I'm know a good bit about them, I'll be more than happy to talk about them. Walter Veith gives a historical view regarding the Jesuits and Catholic church in this video : "The Secret behind Secret Societies". It is given from a Christian perspective, but well researched non the less. I think the fact that few researchers expose the Jesuits gives credence to how much power and influence they have. "Why never talk about the top of the pyramid: The Jesuits?" I think researchers either don't know about them, are working for them, or are too afraid to talk about them. If Eric Jon Phelps is correct in how extensive their influence is then it would seem ridiculous that prominent researchers out there wouldn't know about them. Leo Zagami has been recently labeled as a coadjutor by Szymansky and Phelps. You know, it could be because there isn't much information available for researchers to go into detail. I don't know. The Jesuits are an important piece of the puzzle that needs to be discussed more. Leo Zagami talked with Eric John Phelps and then he withdraw the acusation of being a coadjuntor of the jesuits. Really this video are great expaining who is in charge really. Last edited by Ashatav; 09-16-2008 at 07:44 PM. Do you have a link for that? I'd really like to see that, Ashatav. Time to look at the top of the pyramid. I recherche the power structure of the tyranny now a time. At the beginning i thought that the bankers are the most powerful organization in the power structure. But this is wrong. They owe and organize all physical wealth, and it is there jop to steal all wealth from the world. But the priesthood it and was in all times the intellectual center of the tyranny. It is there jop to lock behind the physical world, and there jop to steal all the knowledge from the world. And knowledge is match more then material wealth. 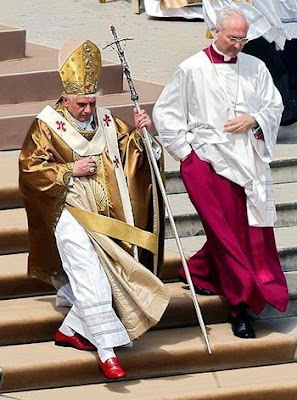 If you see a culture rotten in egoism, you will see all the time, the priesthood is the most rotten place of all, because priest under egoism become spiritual poison mixers, to build there sick imperials to slave all under them. Way the vatican?, simply because it was the most successful organization in this barbarian game. We know now there are 2 sides, the white pope in the open and the black pope in the darkness (the jesuit general). But i expect a trinity, so there has to by a synthesis of this 2 sides, or the boss of this two popes. For now i fount no information's, who or what this could be, but i expect there is a hidden king. Last edited by peterh; 09-18-2008 at 08:25 PM. I also find it strange that there isn't much talk about the Jesuits when they obviously have immense power. But are they really at the very top? I don't know, I consider them a part of the Illuminati. Rockefellers, Rothschilds, Jesuits... in a way they have common goals but at the same time, treacherous bastards as they all are, I believe all of them have their own agenda and each of these factions would like to think of themselves as being at the very top. The Jesuits focus on the religious aspect but thinking that converting everyone to catholicism is their GOAL... nope, not a goal, just means. Because if you ask yourself "why do they want everyone to be catholic" then you get the answer to what their goal is. If they succeeded in that, they would be like gods on earth - if all earth is catholic and they're the top of the catholic pyramid, they have all the power. The goal is simply power and control. Just like with Rockefellers/Rothschilds or any other big time a**holes. It just so happens that their prefered way to achieve this goal is through religion. And one thing they have and others don't, is the Vatican Library, which is of more than just little importance, and a decent advantage for them. Because seriously, you don't believe they want to make everyone catholic because they want all people to have the right faith and to be "saved", right? Converting everyone to catholicism is in my opinion impossible, ever. So plan B would be... killing everyone who doesn't want to convert? Oh wait, that sounds way too familiar, a history lesson maybe? I don't think they would mind doing that. Besides, Eric John Phelps says they're more of a military organization than religious, as for the structure, and I have no reason to not believe that. So in the end they are not that different from the other power-hungry factions. I'm not sure if they're at the very top. But I'm sure they want to be. I also find it strange that there isn't much talk about the Jesuits when they obviously have immense power. Actualy are very little amount of people who talk about the Jesuits and the Catholic church. Look at the history of them, all ends dead! Alberto Rivera and Chiniqui where assessinated after several atempts. The majority of the books about the subjet are misteriously stolen of libraries, etc. They have a GREAT network of desinfo, actually they are historically good at decieving. Now, look at Alex Jones, he NEVER touch the subjet. Leo Zagami says he are there exactly for that purpose, to make the courious people, who likes these topics unaware of the real top. He are the show for the curious. Look at this about the topic. A good talk about Jesuits: part 1, part 2. Knights of Malta. A civil branch who serves the vatican, do you know that many of the cia directors are of that organization? Knights of Columbus: political focused vatican serving organization. Bill Schnoebelen says that before he could be a catholic priest he must be a Satanic priest! Google him! Bohemian groove: Look at the history, in wikipedia if you like, of Bohemia (why alex jones didn't show any catholic reference or catholic mass? there are a lot in there). Look at this video in the 12 minute are a list of really important figures who are inside vatican organizations. Look at this realy good video "Exposing the satanic empire" it's really good for introducing these topics (it has some flaws but gives a great big picture). Look at alberto Rivera chick's comics to, enlightening ones. Why the 2 presidents of the invaders countries in Irak wet to have the pope blessing before the end of they goverment? The thing is Bush may have a lot of muscle power but without the blessing of the pope, hush! he banish from the face of the earth. The thing the catholic church are the Mother of all the stupid organizations who have terrenal power and no trascendence in the spiritual realm like the bilderbergs, illuminati, etc. That's because the catholic church aren't a cristian religion, are a Mistery cults/mythraistic amalgalm with a cristian face. The Zeus statues becomes st. Peter and Venus becomes mary (who are put in there to diminish the figure of Jehoshua). Really, there are a LOT of information, just search in internerd. PD: Now, Leo Zagami says that a positive shift of counciousness are going on an the jesuit are trying to control the spiritual side of people searching for a new Messiah, ha, ha yes sure, they can't do that, forget it, the people will not buy it. Last edited by Ashatav; 09-21-2008 at 07:54 AM. depending on the sin, it would be give us a 1/3 or a 1/2 of it) i think people are starting to see right through these clowns !!! Religion in the hands of tyrannies is only a mind controlling tool, and by loges and diverse sects witch are at there hierarchical to sit al together on one table, religion is a many sided hydra or octopus whit at the end the same center. The people they get not under the control of religions, the get under control by other mind controlling tools, lice atheism nihilism materialism satanism et et et et et et. Way they work together?, because of the same reason like the mafia bosses work together even if thes are in the same time in concurrence for the biggest territory. But all barbarian organizations need a king, so the mafia use the most successful and intelligent one of them as there king. Without the hierarchy barbarians fall in to anarchy and lose there power structure. hierarchy is expertly important for all barbarian tyrannies, even more important then all the bosses in the game. Without hierarchy, no king of the world. And the hierarchy allows that at the bottom of a structure are normal nice people whit don't have a clue what is going on at the top. So it is important to do not attack a entire system, but only the power at the very top of the hierarchy, because there it stink the most. It is wrong to use words like "catholicism" in general because of many reasons. Not all people of such believing systems are evil, so never attack people in general for there membership of a certain group, luck more exactly by analyze there goals characters an positions in the structure. Use is never "the catholics" or "the jews" or "the ...", it is all the time a tyrannical center at the top of the hierarchy and a mass down follow them used blind misled and manipulated. For the top of the hierarchy there down are only slaves living shields solders or what ever, used to build there own enslavement whit there help. Catholicism is so only a group of many, but interesting because the power structure can tax them directly (in my country they use even the government system to enforce the church tax), and specially it is a shield of sheepy believers don't now what gous on in the center of there organization, and never ever understand that the center is pure satanic, and the evil hide hit self behind what lucks from outside like the most holy. This holy shiny shield is a psychological high barrier to see the real and ugly troth. So if you criticize the church, you have immediately millions of enemies tray to protect there believe and there power structure even whit good indention's. So they don't need to convert everybody whit catholicism because they control by loges and secret societies almost all believing systems (religious and non religious). But anyway it is good for them to have so many people under there direct control as possible, as there shield and tax payers. In the more violent past it was more important so convert people in a period of empire building by war, wen the mafia bosses of tyranny fight against each other to get the biggest peace. now the mafia bosses sit together on a rout table because the territories are now better organized and they have more tools then only violence. And all the time, the holy shine work a shield to hide the truth, even the priests in the lower ranks of the hierarchy would never ever believe what is in the center of the temple empire. Everything is a barbarian power and empire building, everything is organized in hierarchical structure, and everything is up to control all and everything. and there not mainly the matter, it is mainly control of the mind. You have to be under control and dependency of physical power, but mainly you have to be a prisoner in your mind. And long time before technology exist, tyrannies have only 2 main powers, brutal violence and mind control, and the mind control all the time comes first. how else you can get many people under the control of a power hierarchy and a king, to fight murder and die for him? What if they would say "you believe you are king? I don't, so **** of!" "you believe you one all the money in the world? I don't, so **** of!" to keep there power and keep you weak, they have to control people in there mind first and then in the matter. To control the mind is mach more important then to control the matter because the second comes out of the first, and at the end it is the much higher intelligence! To enslave weaker people whit brutal violence don't needs the most intelligent tyrants only a little strategic intelligence, some psychopaths sadists murders rapists and criminals are enough if you get them under hierarchy. But mind controlling is alchemy so a high level science and the space of priesthood. You have to see mind as a form of energy. And more believers you have, more energy is under your control. And the priesthood know how to use this energy, same like the bankers use the energy of money, and the managers in the economy use the energy of human slave work. PD: Luciferianism (who are decieving by nature) are At The Top, and only Top of Catholisism, masonry, witchcraft and so on. Because the Jesuits aren't at the top of the pyramid, no secret society is. With people like him and Leo Zagami out there, the jesuits are sure to keep their power for many decades to come. again,i will will stress everyone research "TEUTONIC ZIONISM". this has nothing to do with jews. jordan maxwell says this group is key to everything happening today. these are the people who became the original knights templar. jesuits are involved and later they merged masonic and jewish kabbalists. he says this is key.